The popular voice actor comments on Rhys's appearance in the game. Perennial games voice actor Troy Baker won’t be appearing in Borderlands 3, despite the fact that his Borderlands character will feature in the upcoming game. The actor said he’s willing to reprise his Borderlands role, but the game was made without his involvement. Troy Baker played Rhys in Tales from the Borderlands, and Rhys appears in Borderlands 3. Baker says he would have gladly reprised the role if he’d been asked. Baker fielded fan questions about his work in Melbourne, Australia this past weekend. 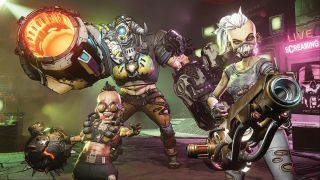 “I really want Gearbox to know that, if they’re going to bring back characters from the Telltale Borderlands, it should really be the people who originated the characters,” he said, riffing on a fan’s question. You can watch his full appearance here. Gearbox's Randy Pitchford was asked about Baker's absence from the game on Twitter, and suggests he was asked but turned it down, while later praising Baker's previous work. Borderlands 3 is out on September 13.